This paper model kit is easy to assemble, requiring just 6 or 7 cardstock paper sheets to print on (110 lb. or 199gsm matte stock recommended), scissors, hobby knife, paper glue, metal ruler and cutting mat. For better results, a foamcore base can be used. The Mermaid Tavern Winter Edition features multiple texture layers, putting you in control over the final look of your model before you print. If you like, you can print several versions of this model and scatter them around your gaming table, and each model can have a distinct look. 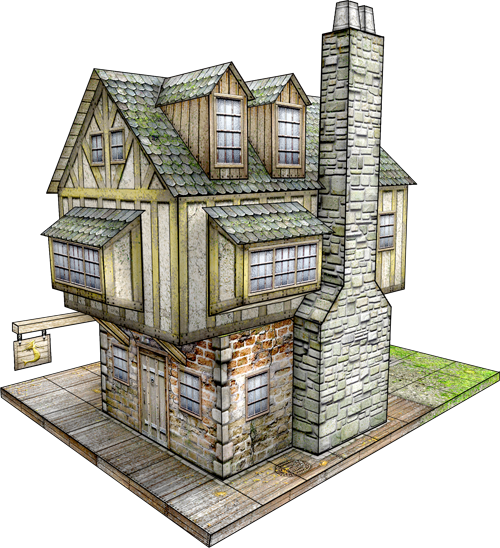 Create your own unique Mermaid Tavern, boating supply shop, riverside inn, fish and chips stand, bait and tackle shop, or cozy seafood restaurant. 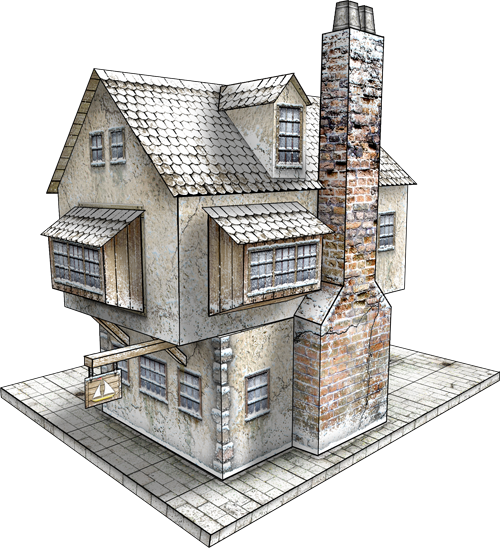 It also works great for Tudor-styled buildings in European historical and many fantasy settings. For your printing convenience, this model includes 3 prepared skins that are easy to print right away. This model's footprint is 5.2" x 4.5", and it includes an optional ground piece measuring 9" x 7". The Mermaid Tavern Winter Edition stands 7.3" high with the optional chimney stacks. This set includes an outhouse, lobster traps and storage trunks.